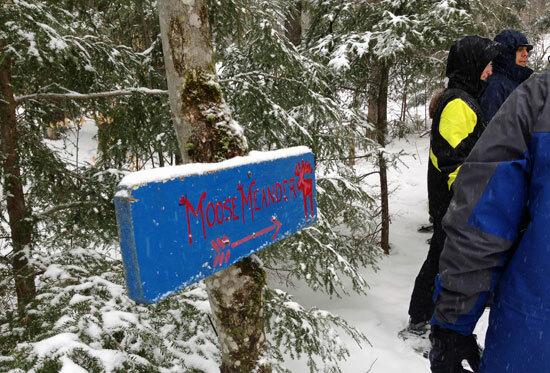 During my family’s recent visit to Smugglers’ Notch Resort in northern Vermont we embarked on a wonderful snowshoe journey through the woods. Unlike our snowshoe tour in Breckenridge, Colo., this trek had rolling hills and was more wooded, making it a nice challenge and a great way to burn off some vacation calories! On the “Soup and Snowshoe” tour, our guide, Laird, started out by familiarizing us with the trails, markers, and maps on the property. About a mile down the trail, we stopped for the “soup” part of the tour. 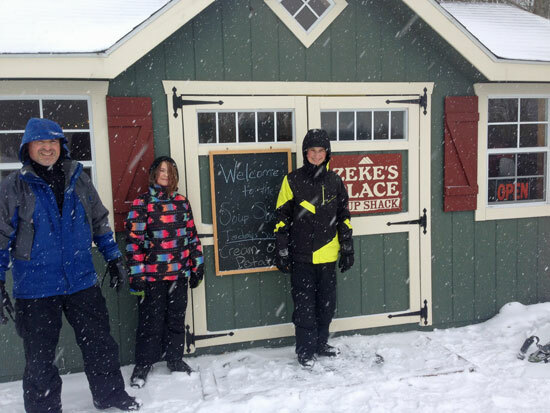 Zeke’s Place (named after Zeke Zucker, Nordic Director and local Nordic legend) is a small shed just big enough for 8 -10 people to warm up with bowls of homemade soup and hot chocolate or tea. 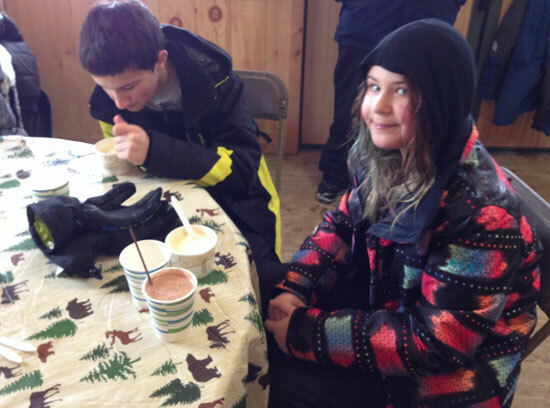 After activities like zip lining, airboarding, skiing, and massages, I wondered if my 16 year old son and 10 year old daughter would find snowshoeing boring. But, much like hiking, they ultimately appreciated being out in nature and they learned a good deal from our guide. 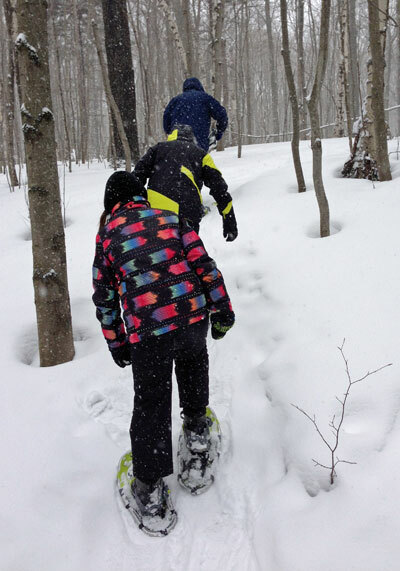 Snowshoeing doesn’t take a lot of skill and it’s an easy way to get the family bonding out in nature. 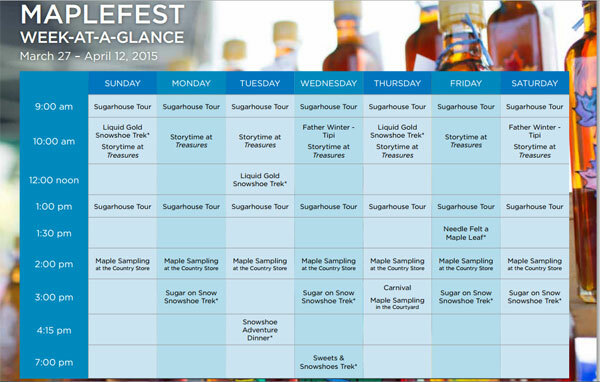 From March 27 – April 12, 2015, Smugglers’ Notch Resort is celebrating MapleFest, where you can immerse yourself in all things maple sugar. You can, of course, enjoy spring skiing at the resort, but you can also tour a sugarhouse, learn and taste during a maple sugaring snowshoe tour, and indulge in maple-themed dining options. For the littler ones, there’s story time and art workshops where they can needle felt a maple leaf. And don’t miss the 80-minute Maple Sugar Meltdown body treatment incorporating massage, body scrub, hot stone relaxation, and body butter. Whoa. Making maple sugar, a rite of early spring in the Northeast, comes with hard work, tradition, and celebration. And you can get a front row seat to the maple sugaring process at Smugglers’ Notch Resort. 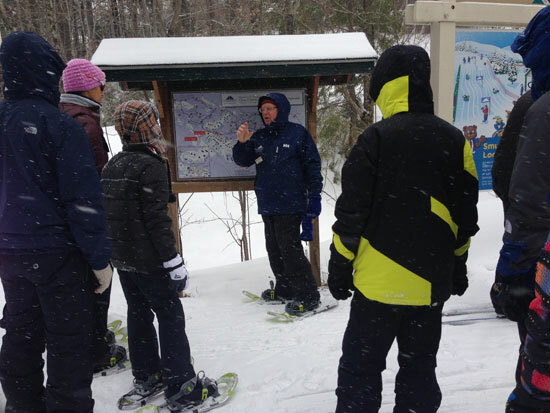 Don’t miss the snowshoe tour! Read my post with more details at TravelingMom.com. Smugglers’ Notch Resort supported my family’s stay to facilitate this review. Opinions are always my own. We are hoping to go to Maine or Vermont around Christmas time and might try out snowshoeing. Looks like a fun challenge. Definitely try showshoeing! It’s easy, like hiking, and such a nice way to enjoy winter! I came close to snowshoeing once in Colorado but can’t remember why I never got around to doing it. I like the idea of pairing it with a soup stop. What a perfect way to warm up. Cream of potato — yum. I’ve always wanted to see maple sugaring ever since I read about it in Little House in the Big Woods.